Dr.Malpani's Blog: Freeze all embryos - Should we stop doing embryo transfers in the fresh IVF cycle? 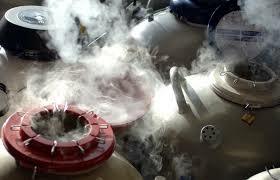 Freeze all embryos - Should we stop doing embryo transfers in the fresh IVF cycle? Traditionally, all embryos were transferred during the fresh IVF cycle. In the past, superovulation used to be gentler, and patients didn't grow too many eggs, as a result of which there weren't many embryos . Also, since the technology for freezing embryos wasn't great , originally all IVF programs transferred fresh embryos in the IVF cycle itself. However, with better super ovulation and more powerful drugs which help women to grow more eggs, we're now getting lots of eggs and lots of embryos , which means it's now become routine for most IVF programs to freeze spare embryos, and they routinely do this for patients who have extra embryos. However, if the uterine lining is ripe, typically we transfer the best quality embryos in the fresh cycle , and freeze the rest . The frozen embryos are used only if the fresh cycle fails, and serve as a back up. However, there is concern that during a fresh IVF cycle , the drugs used for super ovulation have an adverse effect on the endometrium , and may result in the endometrium not being optimally receptive, even though it looks perfect on the ultrasound scan . This means that embryos which could perhaps have become babies if they were transferred into a receptive endometrium will fail to implant because they were transferred in the fresh cycle. The maybe one of the reasons for biochemical pregnancies . This means that the reason for IVF success doesn't depend only on the embryo's genetic competence, but also with the endometrium's receptivity. This is why the pregnancy rates for donor egg cycles , donor embryo cycles , and IVF surrogacy are so much higher than with fresh IVF cycles. When we use donor eggs or donor embryo or a surrogate , we are transferring embryos into a uterus which is being optimally prepared for receiving the embryos. So, why can't we use the same logic when we're treating infertile patients, and stop transferring the embryos in the fresh IVF cycle, when the endometrium may not be optimally receptive ? Why don't we freeze all the embryos , and then thaw them and transfer them in the next cycle , when we can prepare the uterus so it is optimally prepared to allow for embryo implantation? With a " freeze all " policy it is quite likely that IVF pregnancy rates will increase. How dramatic this increase will be is hard to predict , since it's not that patients don't get pregnant in a fresh cycle. However , if there is a significant incremental impact , then it is possible that we will stop transferring any embryos in a fresh cycle , and routinely use a freeze all policy for all patients. One big advantage of this policy is that the risk of hyperstimulation ( OHSS) will go down, because we all know that pregnancy exacerbates OHSS. However, the down side of doing this is that the cost will increase , because then patients will have to pay for the freezing and the thawing of the embryos ; and they would have to come back again to the clinic for the transfer of their frozen embryos. However, if the cumulative conception rate ( the pregnancy rate after transferring the frozen embryos over two or three cycles ) was significantly higher, then this would be a much more cost effective way of ensuring a healthy pregnancy outcome for IVF patients. It's because of vitrification technology , which allows us to ensure a nearly 100% survival rate when we freeze and thaw embryos that a freeze all policy has become possible. As we gain more experience with this, perhaps this will become the routine we follow for all IVF patients.